A new series of 5-(1-benzyl-1H-1,2,3-triazol-4-yl)-4-methyl-2-arylthiazole derivatives, 6a−w have been synthesized by click reaction of substituted benzylazide, 5a−d with 5-ethynyl-4-methyl-2-substituted phenylthiazole, 4a−f. The starting compounds 4-ethynyl-2-substituted phenylthiazole (4a−f) were synthesized from the corresponding thiazole aldehyde by using the Ohira−Bestmann reagent. The structure of the synthesized compounds was determined by spectral analysis. All the synthesized compounds were screened for their preliminary antitubercular activity against Mycobacterium tuberculosis H37Ra (MTB, ATCC 25177). 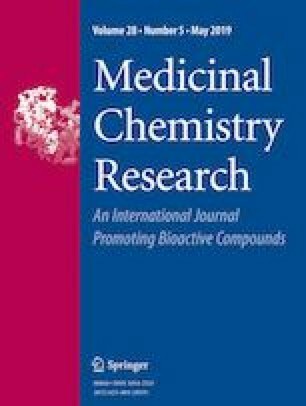 Most of the synthesized compounds reported good activity against M. tuberculosis H37Ra strain with IC50 range of 0.58−8.23 µg/mL. Compounds 6g and 6k reported good antitubercular activity with MIC90 values of 4.71 and 2.22 µg/mL, respectively. Potential antimycobacterial activity suggested that these compounds could serve as good lead compounds for further optimization and development of a newer antitubercular candidate. The online version of this article ( https://doi.org/10.1007/s00044-019-02310-y) contains supplementary material, which is available to authorized users. The authors would like to thank CSIR-NCL, Pune for supporting the biological activity. Central Analysis facility, Savitribai Phule Pune University, Pune is also acknowledged for the spectral analysis. World Health Organization (2016) Tuberculosis Fact Sheet. http://www.who.int/news-room/fact-sheets/detail/tuberculosis.